Apple promised you would be able to print from your iOS 4.2 device, but as it turned out, there are currently only three supported printers. Not good enough. 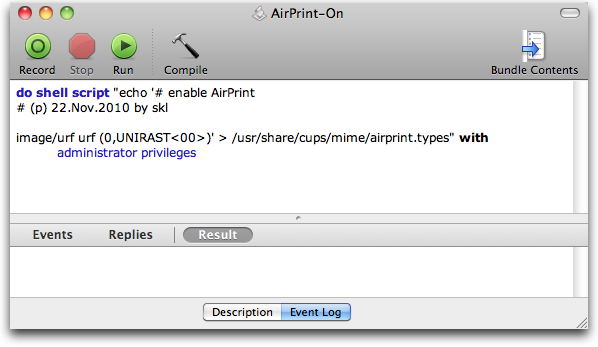 There is a simple procedure to make it work with all printers shared by a Mac with OS X 10.6.5 (10H574). You need to create a small file (/usr/share/cups/mime/airprint.types), remove your current printers, reboot, and add the printers. Once you enable print sharing from the sharing control panel in System Preferences, you will be able to print from your iPad etc. Creating the text file is a bit tricky since you need admin priviliges. This little AppleScript will do that for you. Unzip, start, enter password. If you have a linux server in your local network, you might be interested in this instructions to publish CUPS-printers via avahi (the linux implementation of bonjour). 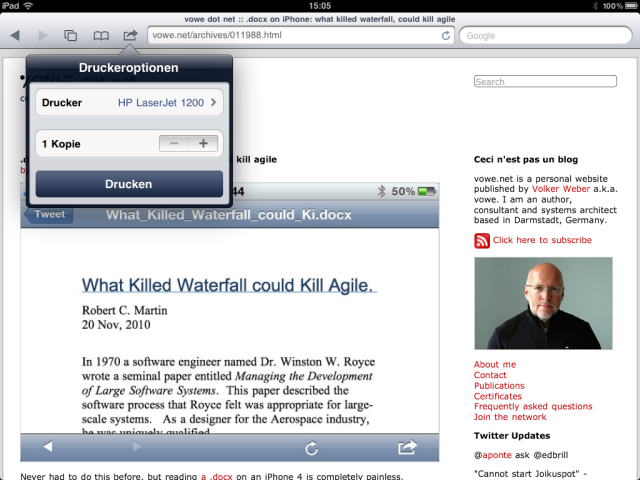 Works equally great and made my iPhone-using colleagues very happy.